The clock is counting down to the next Google update on April 21. This algorithm update, known already by the industry-created term “Mobilegeddon,” will bring significant changes to the world of mobile search. Smart marketers and business owners are paying attention. Until now, Google’s on-page searches have returned similar results regardless of device used — mobile, tablet or desktop. But this will all change come “Mobilegeddon.” According to Google Webmaster Central, mobile-friendly sites and relevant content will take center stage in this new algorithm. “This change will affect mobile searches in all languages worldwide and will have a significant impact in our search results. Consequently, users will find it easier to get relevant, high quality search results that are optimized for their devices.” Read the full deets on this post from Google. In short: if your website is not mobile friendly, and if you’re not providing rich content, your search ranking is about to take a steep dive. Here at Enradius, our client web traffic data shows that, indeed, mobile interaction across all website is increasing incrementally. From banking, automotive, non-profits, media companies and retail industries, they are all watching mobile searches and interactions increase – many have even doubled in mobile traffic year-over-year. The increase in mobile search demand, ultimately, will help speed the website/ digital marketing industry along – the increase in mobile traffic and changes like Google’s algorithm approach encourages companies to have a mobile-friendly website. (Enradius does not build sites or apps, but we encourage our clients to make sure they are incorporating a mobile user-friendly experience in their brand). 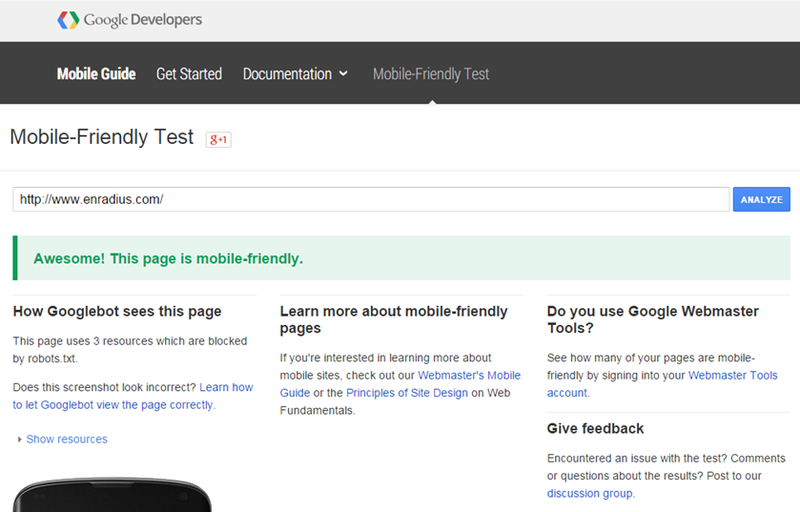 Google has a tool in place for webmasters to test out their pages’ mobile friendliness, and we couldn’t help but put the Enradius site through the rigors. We passed with an “Awesome.” But, we’re realistic that it could change, quickly, after Google’s algorithm update, when our rank might drop. We’re already planning to head off any dip- updating our content. More importantly, we’re planning for an April 22 all-hands marketing review to see how the changes affected our rankings. We would recommend that you run a baseline SEO report days leading up to the Google update, and check your site from a mobile device. Post April 21, check again to see if there are any ranking casualties that occurred from the dreaded “Mobilegeddon.” As long as your site meets Google’s mobile-friendliness, “Mobilegeddon” should be a non-event. Posted on April 9, 2015 February 1, 2018 Author David CarberryCategories Mobile MarketingTags desktop search, Google, Google Webmaster Central, mobile device, mobile interaction, Mobilegeddon, quality search results, search resultsLeave a comment on Are You Ready For An Update?